Liu Xiang and Lerone Clarke stole the spotlight at the Aviva Grand Prix in Birmingham this afternoon (18) posting two of six world leading performances in the National Indoor Arena which also saw Jessica Ennis leap to the top of the season’s women's 60m Hurdles performances and Meseret Defar improve her list-topping time in the 3000m. The Aviva Grand Prix is an IAAF Indoor Permit meeting. 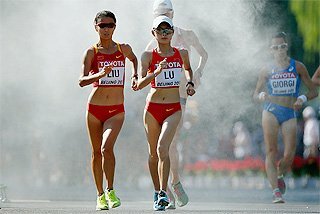 Liu Xiang and Clarke both smashed their national records to beat Dayron Robles and Asafa Powell respectively, while Ennis added a personal best in the Long Jump and Eliud Kipchoge out-sprinted Mo Farah to win the Two Miles. Farah had to be satisfied with a European record, while Shara Proctor broke a long-standing British Long Jump record and Holly Bleasdale beat Anna Rogowska in the Pole Vault. The men's 60m Hurdles was billed as the first clash between Xiang and Robles since that controversial IAAF World Championships final, and perhaps a chance for the Cuban to put the record straight after his Daegu disqualification. But Xiang was having none of it and the flying Chinese athlete stamped his authority on the event ahead of the World Indoor Championships in Istanbul next month with a brilliant victory in 7.41, slicing a hundredth from his own Asian record. He'd already equalled Jarret Eaton's world season lead of 7.49 in the heats when the promise of more to come was clear as Xiang eased down off the final barrier and jogged across the line looking up at the ceiling. In the final he left Robles behind from the start and although the Cuban appeared to dip too soon, Xiang was already well clear. Robles equalled his season's best with 7.50 as Dexter Faulk took third. But Xiang had issued a warning for the rest of the season. 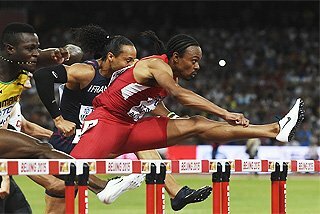 "I still feel I didn’t do very well over the first two hurdles and there is work to be done there," he said. "I am excited about the rest of the year now." If anything Clarke's 60m flat sprint victory was less predictable after Powell had equalled his world lead in the heats with 6.50 ahead of Kim Collins. Not bad for his first race at the distance for seven years. But Clarke and Nesta Carter weren't to be outdone as they ran neck and neck to cross the line just a fraction slower in 6.51 and 6.52 respectively, setting up a mouth-watering final. It didn't disappoint as the three Jamaicans strained neck and neck down the straight. Clarke was quickest out of the blocks and in the end that was enough as he took the verdict on the line in 6.47 while Carter pinched second from Powell, 6.49 to 6.50. "I’m grateful to do it, especially to get a national record," said Clarke. 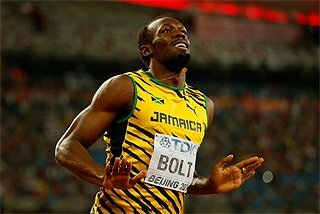 "Asafa Powell, Nesta Carter, they’re all fast guys so to come here and win is fantastic. "I knew that all I had to do was get out of the blocks and drive hard, get up and run home, and it didn’t matter who was out front, just focus on me." That was Jessica Ennis' plan too as she set the arena alight with a stunning hurdles victory over Danielle Carruthers. Ennis looked superb in equalling her PB of 7.95 at the UK championships last weekend, but she blew that out of the record books here clocking 7.87 to knock Lolo Jones from the top of the world lists as last summer's Diamond Race winner struggled to keep up. Ennis got a great start in lane three, but Carruthers was just a fraction behind in the lane beside her. The American tried to challenge but Ennis held her form and edged ahead over the final barriers. "I would have loved to have run 7.94 here, so to run that time is just brilliant," said Ennis, who was on such a "high" afterwards that she trotted a lap of honour, seemingly forgetting that she a long jump contest to come. 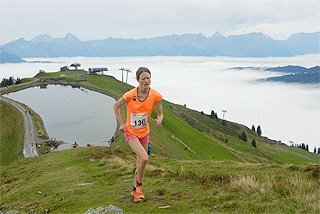 "I didn’t expect to run that quickly at all. I feel in really good shape and the hurdles have been going really well." Ennis' win was the first of eight victories for Britons on a great afternoon for the host nation, although there was no win for the one most fans had come to see as Farah for once just didn't have the leg speed in the final stages of a pulsating Two Miles. The race had been set up as the meeting climax and for the UK's favourite distance runner to take another rousing victory and break John Mayock's 2002 national record of 8:17.06. The record went, but Kipchoge was just too good over the final two laps. 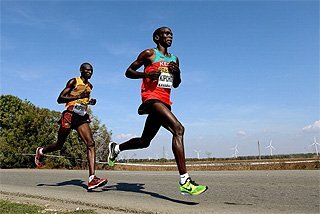 After stalking Farah and Tariku Bekele through a first mile run in 4:05.6, Kipchoge took the lead at the bell and pulled away round the final bend to record 8:07.39. Farah fought back to take second in 8:08.07, not only well inside the British record but better than the US mark set by his training partner Galen Rupp last weekend. "With Galen running 8:09 I definitely thought I could match that," said Farah. 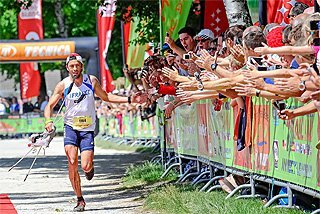 "But I felt a bit flat on the last kilometre because I’d been up with the pace early on. "It’s tough out there you know, you can’t always win and races like that really keep you on our toes." Moses Kipsiro slipped ahead of Bekele to take second in a Ugandan record of 8:08.16. Defar smashed her own world lead to win the women's 3000m ahead of Kenyan Helen Obiri and Gelete Burka. The former World and Olympic 5000m champion who is the reigning 3000m World Indoor champion led through 2km in 5:44.54 closely followed by Obiri and Burka before turning the screw over the last three laps to win by a large margin two seconds inside her own world lead. Defar stopped the clock at 8:31.55 with Obiri second in her lifetime best of 8:35.35. Burka held off Meselech Melkamu for third, while Britain's Helen Clitheroe was fifth. Britons won all four field events, topped by Proctor's national record in the Long Jump. 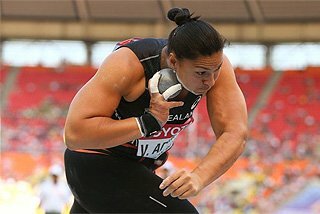 In fact, she did it twice, first adding a centimetre to the record with 6.71 in round three before extending it to 6.80 to go third on the world rankings. 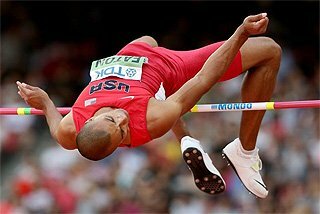 "In my mind I knew I could jump 6.71m because I dreamt it last night," said Proctor. "So I came out aiming at that. And then I said 'Shara you can go further'. So I did." Kerin Mey of Turkey was second with 6.66, while Ennis produced her second PB of the day when she leapt 6.47 for third. "I was buzzing after my race this morning and I took that into my jumping," said Ennis. "I’ve been saying for a while that I need to get some consistency in my jumping, so that’s what I’m looking to do." Bleasdale lived up to her billing to win the women's Pole Vault. The British record holder became an instant star of British athletics since leapt to third in the world with 4.87m last month and she was pleased to beat Poland's former world champion Rogowska her on countback here as both cleared 4.70. Bleasdale had almost gone out at her opening height of 4.52 as at first struggled to master her new longer poles. "To come out here in front of this capacity crowd where there’s a bit of pressure and jump 4.70m again is obviously what I keep aiming for," she said. "I still feel like there’s something lacking in my jumping. I’ve not had much practice off 16 steps. My run up was really good again today, but I can’t seem to translate that speed into my vault to get the big heights, but to jump 4.70m, I’m really happy." Robbie Grabarz continued the theme in the men's High Jump taking victory over Michal Kabelka with 2.32 before having three close attempts to dislodge Steve Smith as British record holder. Aiming at 2.39, Grabarz twice grazed the bar with his shoulder and was desperately close to going over on his third. There was another British victory in the men's Long Jump where JJ Jegede leapt a personal best of 8.04 to beat Luis Meliz of Spain with Godfrey Mokoena third. Elsewhere on the track, Tianna Madison confirmed her status as the world's leading women sprinter this year she produced another world class performance to beat Ivet Lalova. 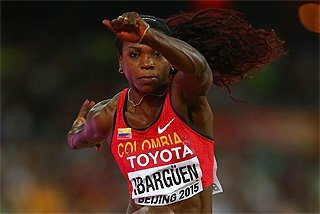 Madison recorded 7.07, a time only she has beaten this year, to see off the Bulgarian. "I felt good, but I still had work for it," said Madison. Again there were PBs down the list as Lalova clocked her best, 7.14, in second while Ezinne Okparebo broke the Norwegian record with 7.17 in third. There were also PBs of 7.19 for Britain's Asha Philip and 7.25 for Jamaican Aleen Bailey in fourth and fifth. 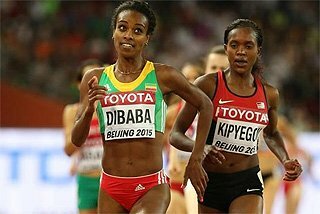 Genzebe Dibaba cemented her place at the top of the world 1500m list as she won the women's race by a country mile in 4:01.33. 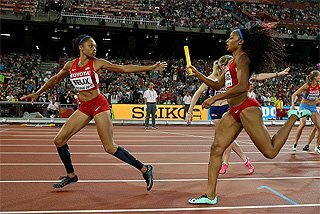 Having been taken through 800m in 2:11.46 by the pacemaker, the young Ethiopian wound it up to pass the bell in 3:30.92 and sped home to break the stadium record with a time only she has bettered this year. Hannah England won the fight for the minor places, clocking 4:09.79, her best of the year, in second as USA's Anna Pierce was third. Nixon Chepseba won the men's 1500m after a last lap tussle with Bethwel Birgen and Gebremedhin Mekonnen. The Kenyan lost the lead at the bell when Birgen attacked but fought back off the final bend to take the line in 3:34.70, third best in the world this year. Birgen was second in 3:34.88, with Mekonnen setting a lifetime best of 3:34.89 in third. Surprisingly, Bernard Lagat was never in the race and finished adrift in fourth. Mohamed Aman lunged ahead of Marcin Lewandowski to win the men's 800m in 1:45.40, an Ethiopian record for the 18-year-old World Youth silver medallist, and second only to Lewandowski's fellow-Pole Adam Kszczot on the world list this year. 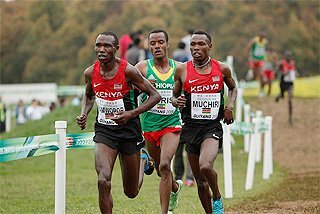 Lewandowski led Aman and Kenya's Boaz Lalang clear of the field and these three battled it out over the last lap. Lewandowski looked as if he would hold on before Aman's dip on the line. Lewandowski was rewarded with a PB of 1:45.41, while Lalang clocked 1:45.75 and British champion Joe Thomas lowered his PB by more than nine tenths with 1:46.35 in fourth. Polish champion Angelika Cichoka came from fifth to first in the last half lap to win the women's 800m. Cichoka outran Italy's Elisa Cusma in the last few strides to record 2:01.90. Cusma held on for second and Marilyn Okoro took third in 2:02.62, booking her place in Britain's World Indoor team. Britain's Nigel Levine won a men's 400m that came to dramatic end when Nery Brenes of Costa Rica crashed to the track just 15m from the line. The Pan American Games champion last year, Brenes went through the bell in 21 and bits, and appeared to be on for something special when he caught his spike in the track and landed face down. Levine skipped past to win in 45.71, a PB by four tenths, while Chris Brown was third. Richard Buck will join Levine on the plane to Istanbul after winning a national 400m in 45.88, smashing his personal best by a third of a second. Williams took an even bigger chunk from his best with 46.20, an improvement of more than a second. Shana Cox completed Britain's dominance of the two-lap races as she took the women's 400m in 52.18. The Czech Denisa Rosolova was second in 52.44.